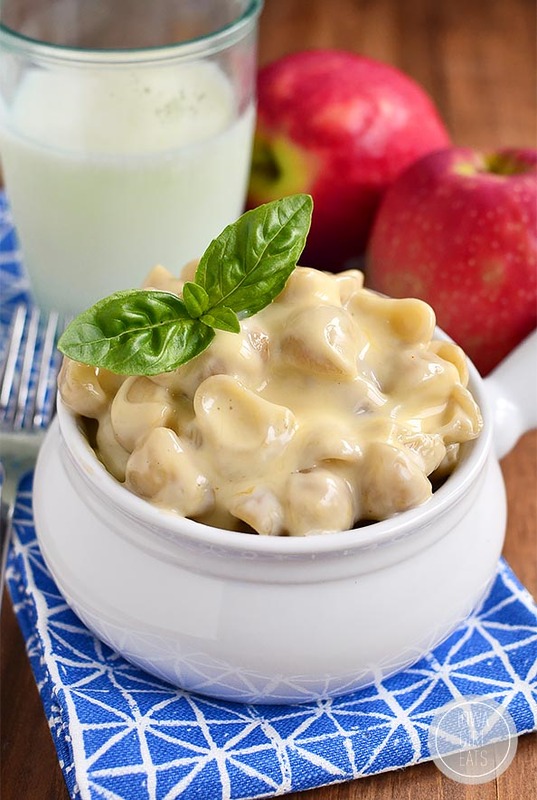 One Pot Gluten-Free Mac and Cheese is as creamy and decadent of a mac and cheese recipe as they come! So easy to make and you’d never know it’s gluten-free. Anyway, greetings! I hope you had a super Memorial Day weekend! It rained pretty much nonstop from Friday to Sunday, but we got out a few times in between rain drops. Monday was gorgeous so the whole family planted themselves on my parent’s back deck to enjoy a tasty cookout under the sun before the rain rolled right back in later that night. In the meantime, I’ve got mac and cheese on the brain – One Pot Gluten-Free Mac and Cheese to be exact! Get. Ready. The other day I was talking with a friend who is getting tested for Celiac Disease about what her last glutenous indulgence would be if diagnosed, and what mine was too. Any guesses? A hand-tossed chewy pizza? Fat corner slice of Pepperidge Farms Birthday Cake? And ice cold Hell or High Watermelon (or three)? Umm…it was ALL THE CHOCOLATE MUNCHKINS. All of ’em. Practically cleaned out the neighborhood Dunkin’ Donuts! Ben had a box waiting for me after I was diagnosed which I proceeded to scarf with reckless abandon as soon as we got home from the doctor. You know those really remarkable meals that come around once in a blue moon that make you put down your fork and think, I will never forget this meal! but then you do but it’s no big deal because you can usually just have it again? I will NEVER forget the chocolatey aroma, crisp snap of powdered sugar icing, and doughy, fluffy interior of those chocolate munchkins. That, my friends, was a meal to remember. And it was legitimately a meal because I ate more munckins than I will ever admit to out loud. Whelp, I didn’t see waxing poetic about donuts coming when I sat down to write this post! At any rate, mac and cheese is one of those meals that’s not inherently gluten-free but unlike mini fried chocolate cake donuts, is a SERIOUS cinch to adapt, especially because my version has no flour roux. Just 5 ingredients (including salt and pepper!) 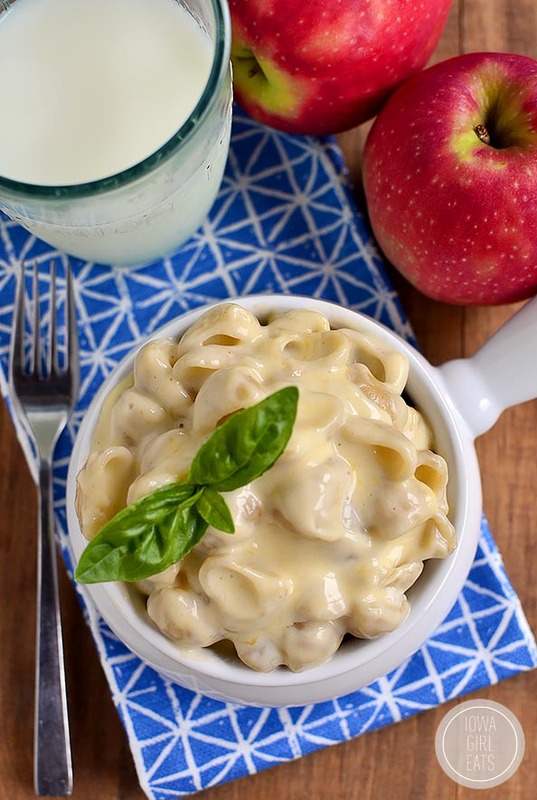 combine in one pot to make the creamiest gluten-free mac and cheese that tastes like it has loads of cream and butter but is made with, get ready for it….SKIM MILK! After my CD diagnosis was confirmed and, you know, I wasn’t eating chocolate munckins like a gaggle of hangry toddlers, Ben and I had a dreadful moment in time where we thought it’d be a good call to take the cheese packet from a box of Velveeta Shells and Cheese that had been sitting untouched in our pantry since, I don’t know, 2010, and mix it with cooked gluten-free pasta. Holy cow. 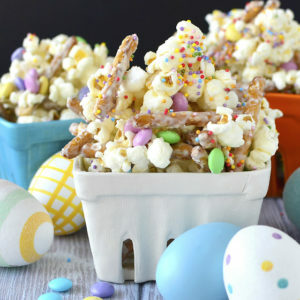 VSAC was a staple in both our childhood diets but we both made it about 2 bites in before waving the white flag. It was SO bad! The good news for you and me though, is that you can get a bowl of creamy, Velveeta-esque mac and cheese without having to put a block of the orange stuff in your grocery cart, and it’ll be gluten-free to boot. Plus this recipes falls into the “throw stuff in a pot and stir” category so, um, hollar. Start by rinsing 2 cups gluten-free pasta under cold water. I used shells but you could use any short cut pasta. The weight should be 6oz. 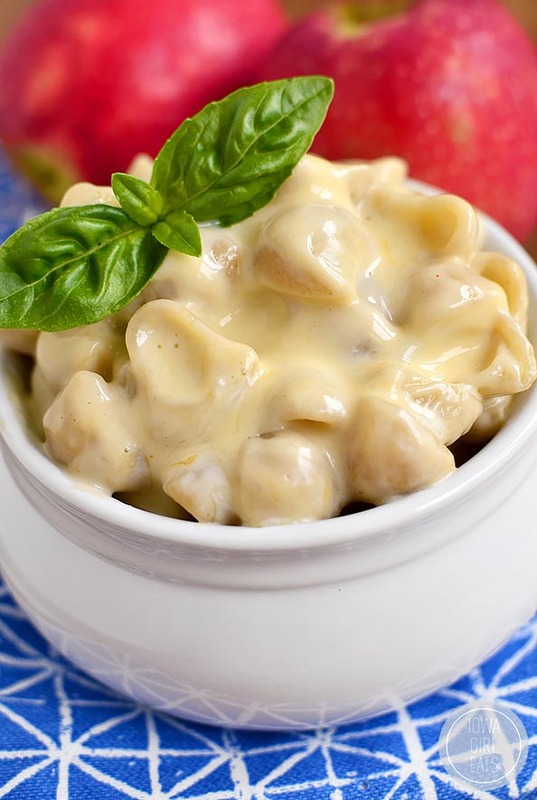 Add the rinsed and drained pasta to a saucepan with 2 cups skim milk, 1 teaspoon salt, and a dash of cayenne pepper. Turn the heat to medium then stir constantly until the milk comes to a simmer (mine took about 12 minutes.) Turn the heat down to low then stir constantly until the pasta is tender (another 12 minutes – scroll through Instagram while you stir – you’ll be fine!) Be sure to stick to low heat because if the milk cooks off too quickly there won’t be enough left to cook the pasta. See how thick the skim milk gets by stirring with the starches released from the pasta? Crazy town! 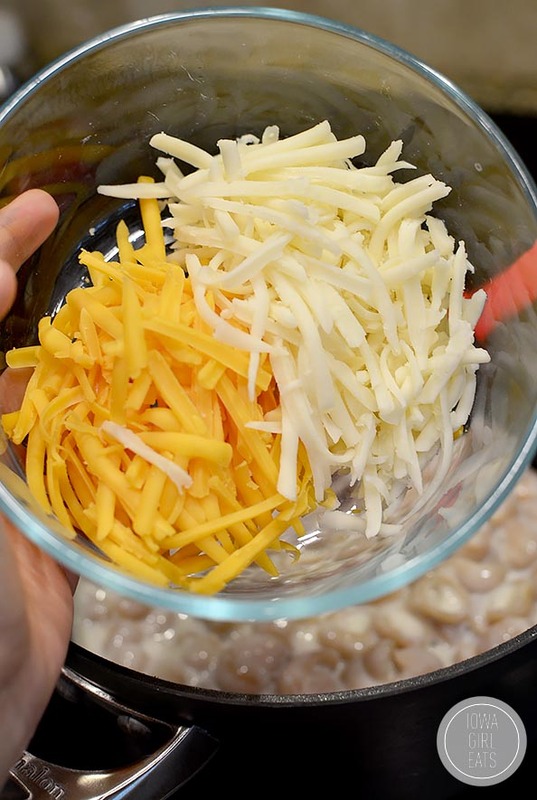 Once the pasta is tender add 1 cup freshly shredded cheese (skip the pre-grated bagged stuff!) then stir until the sauce is smooth, adding in a splash of skim milk if you need it. This is the fun part of the recipe because you can play around with the cheeses you like and/or have in the fridge – you really can’t go wrong! I used equal parts shredded cheddar and mozzerella. Mozz gives the mac a gooey stretch so if you want to stick with the classic creamy sauce texture stick with medium-hard cheeses like cheddar, monterey jack, and fontina. Let the mac and cheese thicken for a few minutes with the lid on the pan, then dish ‘er on up! 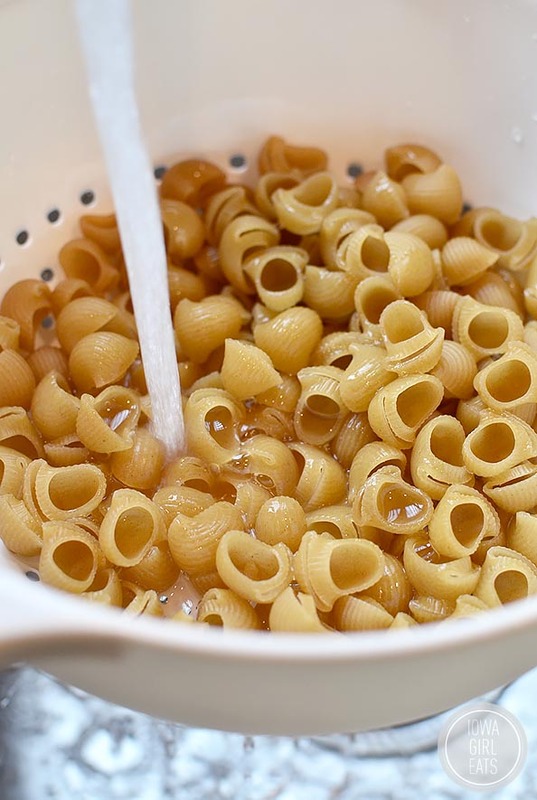 Rinse pasta under cold water in a colander then drain and add to a saucepan with milk, salt, and cayenne pepper. Turn heat to medium then stir constantly until milk comes to a simmer. Turn heat down to low then stir constantly until noodles are tender, adding an additional 1/4 cup milk if noodles have absorbed all the liquid but aren't tender yet. There should be a bit of milk left in the saucepan to create the cheese sauce. Add cheese to pan then stir until smooth, adding a splash of milk if necessary to help smoothen the consistency. Place a lid on top for 5 minutes before serving. 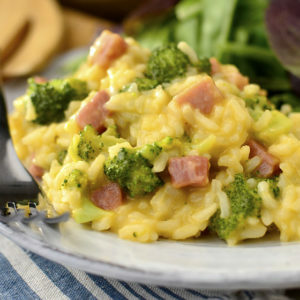 Make this once and you’ll be whipping it up from memory at least once a week – it’s definitely a keeper! And you can of course use regular pasta in place of gluten-free pasta, too. One Pot Mac and Cheese for all! Yummy! Just to clarify, you are rinsing the uncooked pasta under water before cooking? I assume if you are using regular pasta versus the gluten free you would do this as well? Looks tasty! 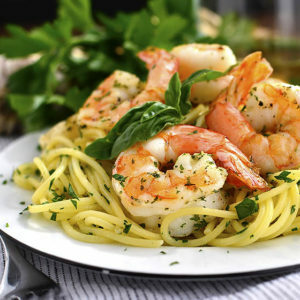 Could you use regular pasta in this recipe? I’m totally going to make this. I’ve tried so many different gluten free mac and cheese recipes and been so disappointed by most of them. Time for a good one. This looks amazing! I, too, grew up on VSAC and always loved it. Curious as to why you rinse the pasta before cooking. I know to rinse quinoa because of the bitterness, but haven’t rinsed GF pasta (or regular pasta for that matter). Thanks! This is my kind of recipe! Would you be able to use Almond Milk in place of Skim? Just wondering! I didn’t test with almond milk, just because I was using cow’s milk cheese, but I bet it would work! 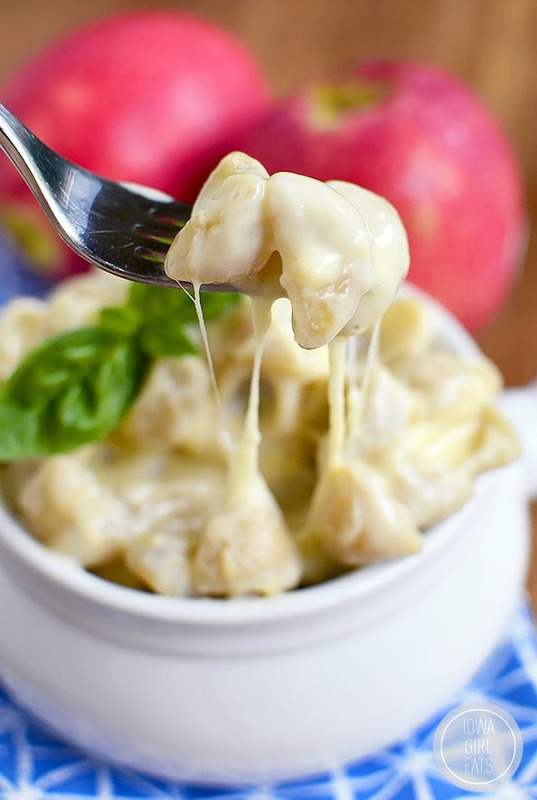 I love adding some smoked gouda when I make mac and cheese! 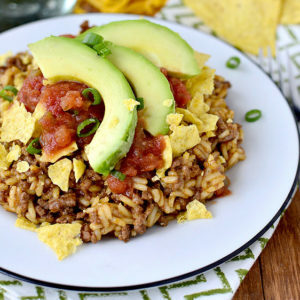 This looks so delicious and easy; perfect for a busy weeknight! I’ve been wondering if there is a disadvantage to using the pre-shredded cheese. Why do you recommend shredding it yourself? I would definitely hand-shred the cheese fresh vs using pre-grated! I agree – shred your own it is awesome and doesn’t have all that added stuff to keep it fresh or from caking. 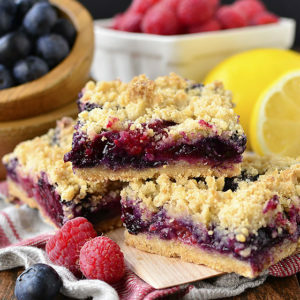 This recipe is 100% up my alley! Look at that cheese sauce! Yum! Macaroni and cheese is a particular weakness of mine. 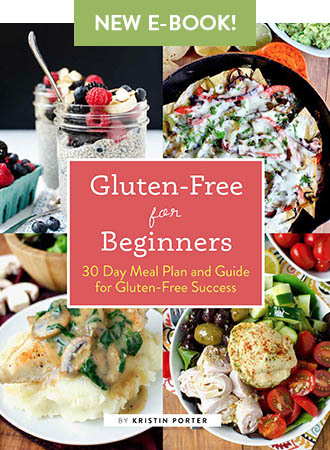 :) I’ve been dabbling in gluten-free baking, in particular, but maybe now is the time to try my hand at gluten-free cooking, too! Thanks for the recipe! Never thought of cooking the pasta in the milk before..love it! 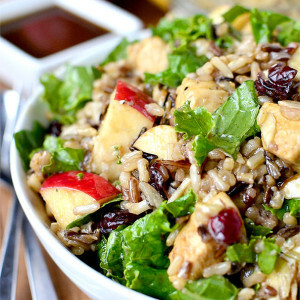 Yummy recipe that is pretty guilt-free. I love adding a little bit of Parmesan Cheese as well. This is great, thank you. What a genius idea ! I made this last night with regular pasta (because we aren’t gluten free) and it was perfect! My family loved it. Seriously easy and very good. 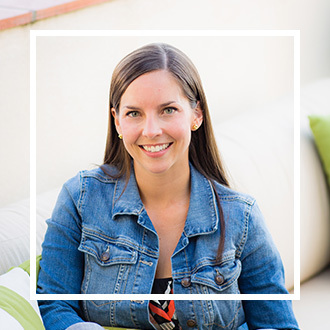 I have Hashimoto’s Thyroiditis, and gluten intolerance/CD can go hand-in-hand with it. I tested negative for CD, but my doc said that doesn’t mean I don’t have a gluten intolerance. So I’ve been going back and forth with trying to go gluten-free; I’ve read a lot of people with Hashi’s have and have felt so much better without gluten. So I think I’m going to give it a go and see if this icky bloated-all-the-time feeling gets any better. And I’m starting with this mac and cheese. Dear lord. Good luck, Noelle – you’ll do great! Not trying to tell you to do anything you’re not comfortable with but I know several women with Hashis that have found great relief eating GF! Noelle, I also have Hashi’s and tried to go GF, but it I didn’t notice at difference at all, so after 2 months, I went back to gluten. However, I’ve been taking “Align” probiotic and it has definitely helped with the bloating. Just thought I’d pass that along! Is there a difference between table salt and Sea Salt? I doubled the recipe last night so I used 2 teaspoons of salt (mine is Sea Salt from Penzy’s spice store), but it was way too salty. And I really like salt, so usually I’m not sensitive to it. I used colby jack cheese, too, so maybe the salt content of the cheese was higher? Next time I would use half the salt, but the cooking noodles in milk was GENIUS! Thanks for the great recipe! Yes, Sea Salt is saltier in flavor compared to table salt. I’d suggest useing about half of what the recepie calls for, then adjust to taste. Do you have a particular brand of GF pasta you recommend? 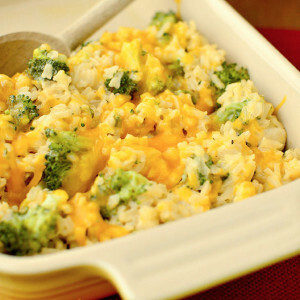 This looks delicious and I am always looking for good mac and cheese recipes! This is healthy hedonism at its finest! Looks absolutely delicious! I love most of your recipes. I did make this but didn’t like the skim milk I will make it again using 2%. Love all your posts. I made this the other night exactly as written (except for using regular pasta) and it was delicious! Thanks for the great, easy recipe! Hi. Have you tried making these into muffins and freezing for Lincoln? Tips? Hey Sarah! I haven’t only because Lincoln is allergic to dairy. I think if you undercook the noodles a bit then finish the dish in the oven it could work! Hi Dani! I’m not sure this recipe would work to quadruple, unfortunately! I think you could double with success, but maybe not quadruple. Brilliant! Why pour starch down the drain just to add it again? She said it was so the noodle did not stick while cooking…. Hope that helps! Hi! How was this heated up? 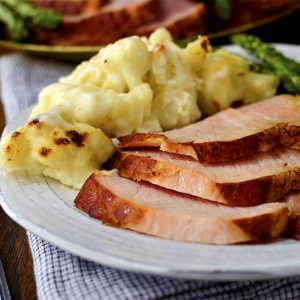 Plan on making this for thanksgiving but pre assembling it on Wednesday and heating it on thanksgiving. Any suggestions? Thanks! This sounds great! I’ll be making it for my friend’s gluten-free daughter next time she comes over for dinner :) What kind of gluten free pasta do you use? Brown rice? Corn? Thank you!! I love Delallo gluten-free brown rice pasta – it’s better than any “normal” pasta I’ve ever tried! It’s tricky to find around here so I usually order it on Amazon: http://amzn.to/1ma5qaP If you don’t want to go to those lengths, Barilla’s corn pasta is great too! 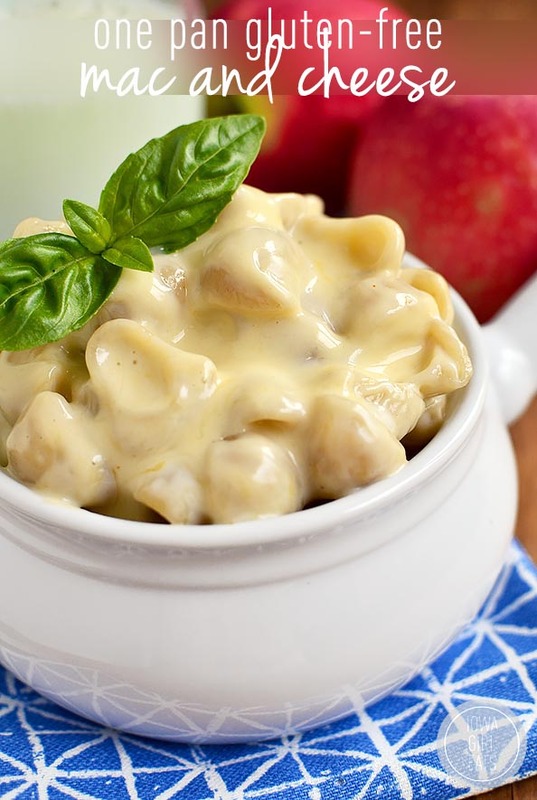 This is the best gluten free mac n cheese recipe! So simple! I use unsweetened almond milk instead of cow’s milk and raw milk cheddar cheese and my family LOVES it!! YAYY!! So glad to hear, Amy! Thanks for the feedback! I made this tonight with fresh white cheddar. After following the recipe, there was a little more sauce than I like .. (my fault not the recipes… i added too much milk at the end) so i decided to stick it in the oven! 350 for 25 minutes with sprinkled cheese on top and it was AMAZING. this is definitely a new favorite! Made this for Easter dinner, specifically for my niece who is GF. I will now be making Mac and cheese this way ONLY. Amazing! I used Barilla GF Elbows, Velvetta and whole milk. Came out perfect. Thanks for the recipe!! I’m so glad to hear it, Johanna! Thanks so much for the feedback! I used rice pasta shells and this recipe was a disaster. A horrible clumpy mess was what resulted. I used high quality ingredients. What a waste of money and time. SOrry but it sure didn’t work for me. I was recently diagnosed with celiac disease and have been on the hunt for a go-to Mac and cheese recipe. This is definitely a keeper! This is the creamiest Mac and cheese I’ve ever had. I made one small modification…1/4 teaspoon of ground mustard instead of the cayenne. Thanks so much! how much calories does it contain ? My daughter was craving mac & cheese, but whining that all the GF versions never really stack up. I found your amazeballs recipe and it worked perfectly. 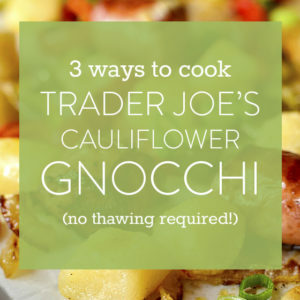 Super easy- super delish! Mucho thanx!! Both of my daughters are allergic/sensitive to dairy. They love mac and cheese; any ideas? I remember reading that your son is allergic to dairy too. If you have any other ideas on dairy free recipes regarding mac and cheese or any other, I would greatly appreciate your help. Hi Tracy! 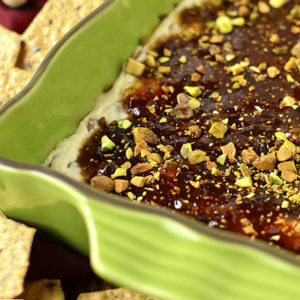 You could try this recipe with vegan cheese. I personally haven’t tried it, and am not sure about vegan cheese’s “melting” capabilities, but I’d start there. My little guy is allergic to dairy and so hasn’t had mac and cheese yet, at 3 YO, either! 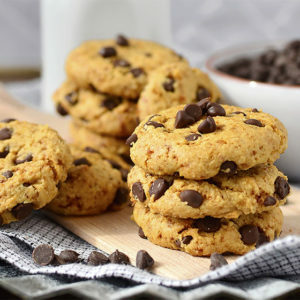 I’ve just made this recipe! I’ve been craving Mac and Cheese for weeks since getting back from Florida but I’ve not been able to find any like I had there! 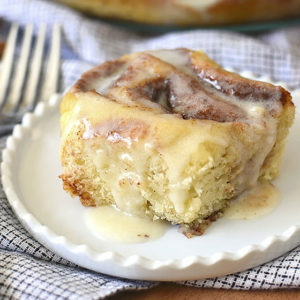 :( finally this recipe is in my life and it’s amazing! However, I’m also dairy free as well as gluten free so I’ve substituted Alpro Soya and Violife vegan cheese and it’s still amazing! Thank you! Thank you so much about letting us know how the vegan version went! I will have to try this for my son, who’s allergic to dairy! Just wanted to say that I’ve made this 4 or 5 times now, and it’s definitely one of my favorite recipes ever! Most gluten free macaroni and cheese up to this point had been blah to me, but this is soooo delicious! Thanks for posting it! I’m so glad to hear that, Courtney! Thanks so much for the feedback! I hate to say it, but this recipe didn’t really work for me. I ended up with way too much milk in the pan, but I didn’t want to keep cooking it because I didn’t want the pasta to overcook and become mushy. I ended up cooking more pasta separately, and added it in. This helped, and made it edible, but I’ll probably choose a different recipe next time. Just too runny for me. That might just be my preference though, as so many others seemed to like it. Thanks for sharing! Never thought of rinsing the pasta, sounds delish! Will be trying this in the next few days for sure. Never thought of rinsing the pasta. Sounds delish. Will be making this in the next few days for sure. How many servings will this make. This recipe makes enough for 2 big or 3 regular sized servings. I tried out your recipe on my youtube channel and gave it a review! I’ll be honest, I didn’t have high hopes for this recipe. I’ve been gluten free for 5 years and mac n cheese has been a challenge to say the least. I kinda gave up until a craving hit me this week and OMG this is THE BEST. 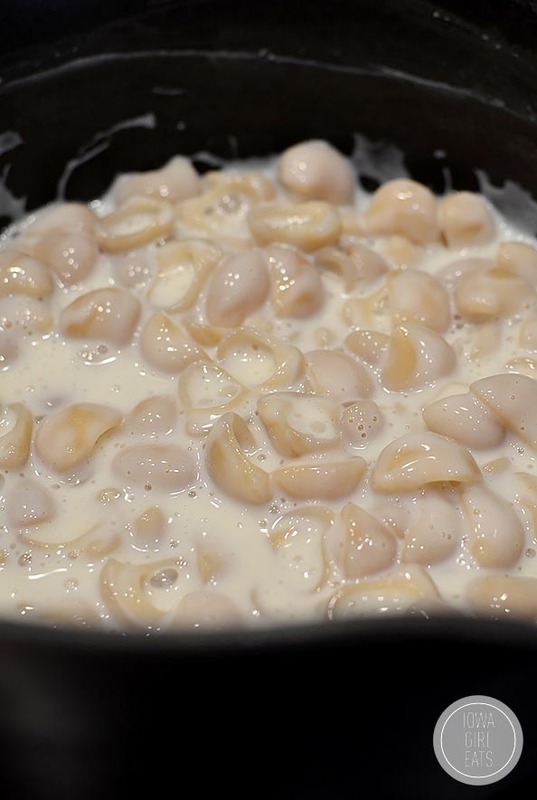 How simple to cook the pasta in the milk to make the sauce. DUH! lol Next time I think I’ll try topping this with GF bread crumbs and stick it under the broiler for a few minutes. Thanks for a great recipe! BTW, for those who are GF, I buy my GF pastas at the Asian grocery store. For whatever reason, their rice pasta is better than any special GF pastas in regular grocery stores. I just made this and it was a huge fail. The only “variation” is that I used the TJ’s brown rice spirals I had on hand. It turned into a thick, gummy mess that was bland, chalky and over-salted. I can’t figure out if I did something wrong or if this recipe just isn’t for me. Can you use a milk alternative like Almond Milk? This recipe sounds yummy and very easy. Thanks for sharing. I’ve never tried it because I use cow milk’s cheese vs vegan cheese. Might be worth a try though!